If it's difficult to move your windows up and down, it could be the plastic rollers in the regulator mechanism. Here's how to fix it. Here's what the mechanism looks like. The regulator is shown in yellow. At the end of each arm is a plastic roller. They fit inside steel tracks (shown in green). Two of those tracks are attached to the bottom of the glass (shown in blue), and a third track is attached to the door. When you crank the handle, the arms move together like a pair of kitchen tongs. Thanks to the rollers and tracks, the movement of the arms coming together raises the glass. It's pretty clever and most car windows use the same method. Like everything else, the regulators eventually wear out. If it sticks or jams, you can take the car to a mechanic and let them fix the problem or you can restore the entire thing yourself and do a better job. Here's how. The first step is disassembling the door. Do one side at a time - that way, if you get stuck reassembling, you can look at the other door as a reference. Take a lot of photos. 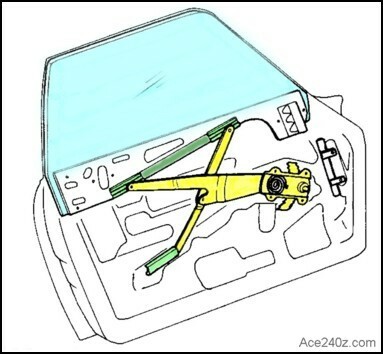 This shows how to remove the door panel. 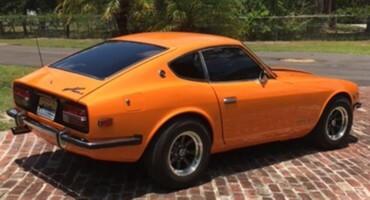 They use a 260z but it's the same as a 240z. This awkward and badly-lit video shows how to remove the regulator. Here's what the rollers and soft bushings looked like in my car. The rollers ride inside steel tracks and the soft bushings prevent the track from rubbing against the regulator's arm. They also help prevent rattling. 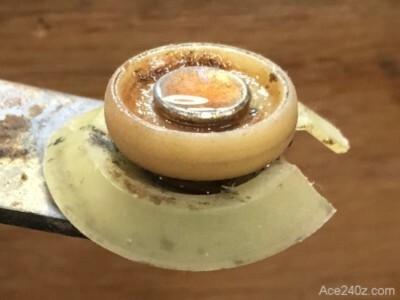 The rollers can be replaced but nobody makes the soft bushings. The 47-year-old rollers were in OK shape, aside from dirt and grit. I used steel wool to scrub the surfaces, then used brake cleaner spray to flush out the grit. It only took a few minues. Are they perfect? No, but I can live with it. New rollers can be found at some of the Z-car specialty websites. "240Ziggy" at ClassicZcars used bolt-on replacement wheels, and plastic tarp grommets for the bushing. Take a look here. I bought a set of the grommets but the manfacturer changed the design - instead of being round, they're triangular and didn't work very well. 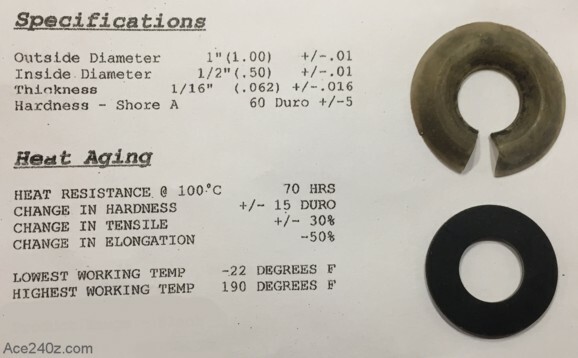 I experimented with things like o-rings and grommets but the best solution I found are neoprene washers with a duro/shore rating of 60A, which is about the same hardness as a car tire. They're 1" OD and 1/2" ID, and 1/16" thick. I attacked a few with a metal file and a wood rasp and the washers held up surprisingly well. In the photo they look smaller in diameter, but that's because the stock bushing is torn and flattened out. I bought them online from a company called Primal 23 Engineering. The price was reasonable but the smallest quantity they'll ship is 25, which means I have plenty left over. I'm sure they'll get used in some future project. Gorilla Glue is a gell designed for rubber. I cut one of the washers and glued it back together, then used it to hang one of the regulators. It stretched, then tore after a couple of minutes, but the rubber itself tore at the glued seam. Since there's no chance the washer will see that kind of stress inside the door, these oughta work fine. Cut the washer and pull it around the roller's shaft. Put a piece of wax paper underneath to prevent the washer from sticking to the metal, then glue the ends with a tiny, tiny dollop of Gorilla Glue and let it cure for 30 minutes. Click the pic for a bigger view. Clean the the tracks with steel wool. Use some fine grade sandpaper on the surfaces to remove any burrs that might rub against the washers. When you're done, give everything (the regulator, the rollers, and the tracks) a good spray of lithium grease. Don't use oil or axle grease because they can thicken in cold weather, making it difficult to roll the window up and down, which defeats the purpose of all this effort. Clean the glass thoroughly. This great video from Panchos Garage video shows how. Francisco has done some incredible work on his 240z project and you should watch his series (and subscribe). If you want to tint your windows, now is the best time. Some people prefer using a film but I'll let a professional do the liquid version. That way there's aren't any clear spots which were blocked by the frame or felt. I'm not going as dark as this example - just enough to block a little sunlight. At the top of the door, near the front, is a small roller that helps keep the glass aligned with the frame. The picture on the right is looking down. They're held in place by the door's upper chrome trim. If the rollers are missing, look in the bottom of the door because they might have fallen off. If they're missing or damaged, find replacements because the glass won't line up in the frame correctly. There's a left-hand and right-hand version, so make sure you get both. 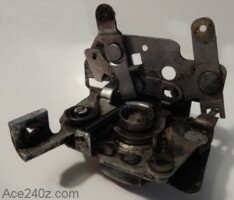 Use brake cleaner on the latch mechanisms and give 'em a squirt of grease. It takes mere seconds. Replace the felt in the window channel. It's easy and fairly cheap. There's a rubber "wiper" at the top of the door that keeps rain out and it can be replaced as described on Hybridz here. Spraying sound deadener inside the door will help reduce road noise. Little things can make a big difference. You'll spend hundreds of hours in your Z, so a few more minutes now is worthwhile. And here's the difficult part: putting it all back together. Watch this Panchos Garage video to see how it's done. You'll probably have to roll the window up and down a dozen times to get everything adjusted properly, but it'll work far better than when you started and should work that good for the next few decades. Now do the other door. If you can't get the windows to line up, take them to your local auto glass shop. There's nothing wrong with seeking a professional from time to time, and since you already did the hard work, the cost for their labor should be pretty cheap. 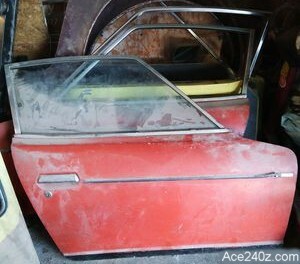 Replace the door panels and the various parts, then sit back and enjoy a beer and savor the feeling of windows that roll up and down without sticking or squeaking or jamming.